Roll the mouse over the small images above to enlarge them. The beach is a 4-minute walk from Villa Roca and the Pagoda Garden along with a private-path. One of the most famous beaches on the island, steeped in beach history, home to the worlds most luxurious super-yachts that come and go the occupants of which frequents the beach restaurants. Benirras is the only bay on the island to be designated a nature reserve therefore not a single hotel in site. Benirras is in the unspoiled north of the island, an area rich in ley lines and with a strong spiritual history. Famous for its wonderful sunsets, the west facing bay is home to a rock known as 'The King of Benirras' which sits majestically in the crystalline waters. The beach has three typical Spanish restaurants and an ice cream and juice bar. Although no longer in existence as such, the August full-moon beach festival lives on in a smaller version each Sunday evening. One of the main attractions and coming from far afield are the drummers and guitarists who give an 'unplugged' concert: their volume builds up into a crescendo as the sun sets. Dancers, fire-eaters, sand-sculptures and craft stands enliven this weekly gathering. The strict local planning laws ensure that no unsightly hotels or resorts are built in this area of outstanding natural beauty. Villa Roca and the Pagoda Garden and the owners Villa Nova are among the less than a dozen villas in this unspoiled nature harbour. A well-kept secret by the locals, the wide curved beach is of soft sand that gently slopes into the sea. The sheltered natural harbour is a popular anchoring spot for private yachts and motor boats, who often gather there to enjoy the romantic sundown. Good for snorkellers. Size: 160 metres long, 40 metres wide. Naked bathing to one side of the beach. Benirras beach has been voted 'the 4th best beach in Europe' by the Sunday Times Travel Supplement and the best address in Ibiza by The best of Ibiza Magazine. Where? On the northwest coast of Ibiza. Why? This is a perfect slice of creamy sand, shielded from the sea by a natural harbour and from the land by steep, forested hills. In the 1960s, Benirras was said to be a venue for debauched, drug-fuelled orgies; today it attracts a sophisticated young crowd, mainly Spaniards, Italians, and Scandinavians. Where to stay: the surrounding area is protected from development, so there are no hotels. 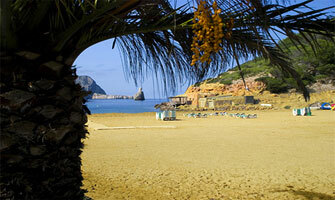 Check out the world famous Ibiza Yoga retreat, great prices and only a stone's throw from this lovely beach. Where to eat: there are four friendly restaurants bang on the beach, open for lunch and dinner. Don’t miss the sunsets. As the sun sidles into the sea, framed by tall rocks, bongo-playing hippies provide musical accompaniment. The best of the action tends to happen on Sundays. Getting there: EasyJet (0870 600 0000, www.easyjet.com) flies to Ibiza from £60.00. From Ibiza town, follow signs to Sant Joan, then to Benirras. A beach shop selling fabulous clothes and beach accessories. For hire: sun loungers and umbrellas. Paddle boats. Canoes. For public use: two beach showers. For food and drink: 4 restaurants. Tarmacadamed car park. No dogs in summer months. The local towns are San Juan and St Miguel 10 and 15-minute drive respectively. Walking to St Miguel takes 45 minutes. Please take note. The beach restaurants are closed during the winter season, they open from May / Easter onwards. Restaurant 2000 on Benirras beach opens at Easter time each year and stays open full time until the end of October.